This time I knew what to expect and was able to enjoy myself more. Dayton’s Schuster Center plays home to what Vogue called “the filthiest, most offensive, and—surprise—sweetest thing you’ll see on Broadway this year, and quite possibly the funniest musical ever.” I would tend to agree. It’s not for the humor-impaired; if you don’t have the ability to laugh at things that some would find offensive then save your money and go see CINDERELLA later this season. But if you like “South Park” and the kind of humor those creative geniuses have brought to the cultural forefront, then this is the show for you. It’s the story of two Mormon missionaries sent to Uganda to convert the Africans. One is a little full of himself and planned to change the world. The other has no self-esteem and has a problem with “making up stories.” Together they learn about life, love, religion, and themselves in uproariously funny ways. Elder Price is played by David Larsen. His chemistry with Cody Jamison Strand’s Elder Cunningham is what drives the show. They work together to create comedy magic. The woman next to me audibly sighed with compassion at Strand’s portrayal of the poor pitiful sack and then burst out laughing the next minute. It’s a good script and really well acted. I also enjoyed seeing recent CCM grad Eric Geil in the Ensemble. He snagged this job immediately upon graduation and really shines in the dance numbers – and he does have the opportunity to show off his golden voice, too. The entire cast from top to bottom was solid. Standouts for me were Candace Quarrels (“Nabulngi”), Daxton Bloomquist (“Elder McKinley”), and Christopher Shyer in multiple roles. THE BOOK OF MORMON is a delightful evening at the theatre. Commercial, accessible, and welcoming – this show is the one to see if you’re not sure you love “theatre” or if you want to get your reluctant, culture-phobic partner to go with you to a show. It’s funny, its smart, and its got a whole lot of heart. 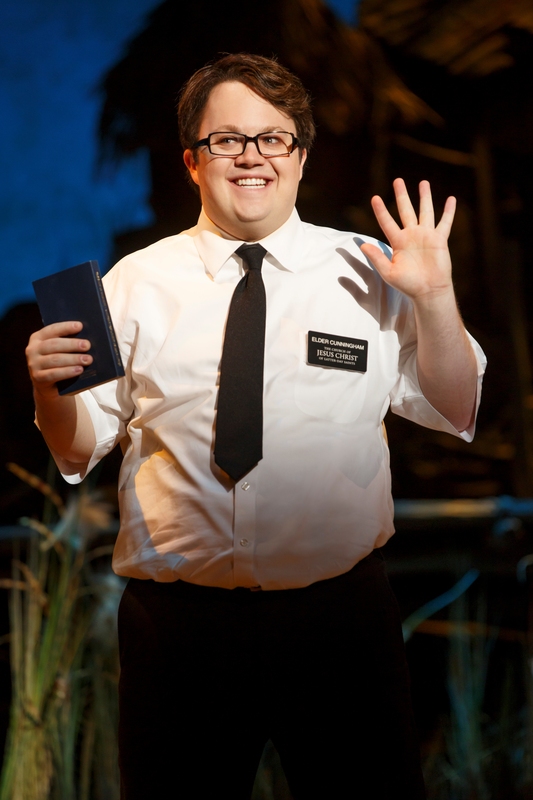 THE BOOK OF MORMON runs through Sunday at the Schuster Center in Dayton. Click here for tickets.